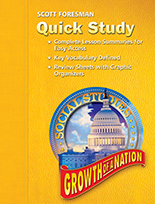 Scott Foresman Social Studies (©2005) components for Growth of a Nation. 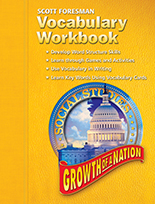 Additional opportunities to practice and apply social studies concepts, vocabulary, and skills taught in the student book. 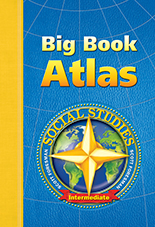 Includes pages for vocabulary, Map and Globe Skills, Chart and Graph Skills, Research and Writing Skills, and much more! Help all students access content with easy-to-read summaries of each lesson from the Student Edition. Quick Study also includes a reproducible version of each Lesson Review in the Student Edition. Four pages of activities per unit reinforce vocabulary skills and help your students practice and understand unit vocabulary. Also includes homework suggestions and vocabulary cards for practice at home. Students learn about geography at their own level with colorfully illustrated political and physical maps of North America and the world. Age-appropriate questions on every page promote understanding of geographic terms. 16 1/2" X 24". 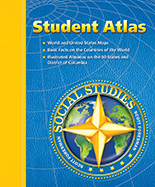 This handy desk reference gives your students access to physical and political maps of the United States and the world, thematic maps on a variety of subjects, fact-filled tables, and an almanac with individual state pages. 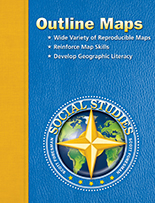 This comprehensive collection of reproducible outline maps for lessons, transparencies, and student reports reinforces geographic concepts and map and globe skills. Included are world maps, continent maps, and U.S. regional and state maps where students can add capitals, cities, battlefields, facts, and notations. These two-sided, reusable outline maps of the United States and the world have write-on, wipe off capability. Package of 10. Give your students a better understanding of our closest neighbors with this four-color supplementary resource. The in-depth content covers all social studies strands and includes document-based questions to promote critical thinking. Teacher's Guide available separately. Invoice Title: SS06 LR 6PK GR.5/6.5A 3,2,1 BLASTOFF! Contains six copies of one title per unit and a Teacher's Guide. 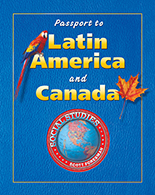 SOCIAL STUDIES 2006 LEVELED READER 6-PACK GRADE 5/6.5A: 3,2,1 BLASTOFF! Teach the same social studies content at different levels to spark student curiosity and create eager learners. Below-level, On-level, and Advanced selections give all students additional reading experiences and enhance the science content in every chapter of Scott Foresman Social Studies. The Super Kit includes six copies of each title in each level for an entire grade. Leveled Readers Teacher’s Guide included.